Spyglass treats you to jaw dropping views from almost every angle. Take a turn around this villa's expansive decks and watch the sea change colors. 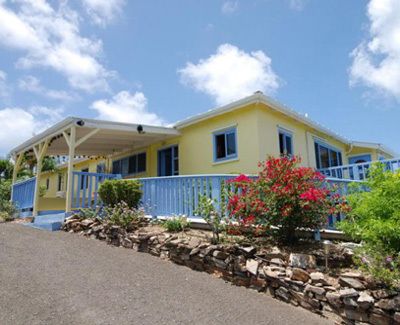 Located in Cotton Valley on the east end of St. Croix, this villa enjoys incredible views of beautiful Buck Island, the reef, and open ocean north and east to St. Thomas, St. John and The British Virgin Islands. Spyglass has something for everyone: sunny decks and shady areas to relax over a good book. There are 3 bedrooms and 3 baths, a comfortably decorated living area complete with a flat screen television with DISH TV, a DVD and surround sound speakers. There is wireless internet for those who must keep in touch. The completely equipped cook's kitchen has a gas stove, side by side refrigerator, dishwasher and an array of small appliances. There is a service bar for 3 for just a quick bite and an indoor dining table in the solarium for dining while enjoying the spectacular views. There is outdoor dining for 6 steps from the kitchen and poolside dining on the lanai. There is a cozy reading nook located in the solarium. The baths off each king bedroom feature romantic showers made of Caribbean Blue-bit stone. One has dual vanities. The third bath has a shower/tub combination. Both king bedrooms have direct access to the pool deck. The beautifully tiled 26' X 14' pool has a step entry and graduated depth. There is plenty of pool deck space and comfortable loungers for sunning.